Protests at four successive home games from sections of the Ewood Park faithful have led calls for Steve Kean to be dismissed as Blackburn Rovers manager but after just eleven league games this season should Kean be given more time to turn around Blackburn’s fortunes? 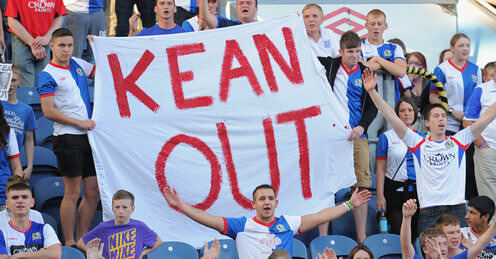 Fans at Ewood Park make their views clear but will Steve Kean survive this tumultuous period? Steve Kean started the season as the bookmakers’ favourite to be the first Premier League managerial casualty. Three months later Kean remains the frontrunner in the sack race as one win in eleven games has left Blackburn just one point from the foot of the table. With Rovers fans turning on Kean more vociferously as each game passes, scrutiny over Kean’s position looks set to linger unless his side can convert promising performances into positive results. Kean’s lack of managerial experience prior to his ascent to the managerial role has always been a bone of contention among fans but the recent run of results have added an even greater strain on the relationship between manager and supporters. While picking up points it is easy to gloss over Kean’s limited experience as a manager and a positive start to his tenure last season saw Rovers rise to eighth position with three wins from Kean’s first seven matches. This may have gone some way to alleviating initial concerns but a disappointing start to the current campaign has sparked calls for his resignation and called into question his ability to manage at the highest level. Since the advent of the Premier League in 1992 Blackburn have employed just ten different managers, showing faith in the men appointed to guide the club forward on the pitch. This was certainly apparent during the reign of Jack Walker and also under John Williams’ stewardship of the club, but this policy looked to have become a thing of the past as Venky’s dismissed Sam Allardyce within a month of taking ownership of Rovers last year. However, after a string of indifferent results the new owners have kept faith with the man they appointed as Allardyce’s successor despite the protestations of a growing number of fans. Unsurprisingly Kenny Dalglish tops the list having guided Blackburn to their first top flight title in 81 years in 1994/95, but Steve Kean’s record leaves him precariously positioned in ninth spot, with just Paul Ince accumulating fewer points per game. Kean has resided over fewer wins per game than any Blackburn manager in the Premier League era, having secured just ten wins in 37 matches, while ominously just six of those victories have come in the league. Since taking charge Kean has averaged just 0.875 points per game in the league. Were this record to be extrapolated over the remaining 27 league games this season Blackburn would finish with just 30 points. When you consider that the lowest points amassed by a side that has avoided relegation was West Bromwich Albion’s tally of 34 in 2004/05 it becomes clear to see why fans are beginning to get uneasy about proceeding with Kean at the helm. By contrast, Mark Hughes’ record as Blackburn manager was exceptional, twice guiding Rovers into Europe while averaging a win percentage in the league of 38.8%, over double the 18.8% Kean has recorded to date. That Hughes does not currently command a Premier League dressing room has not gone unnoticed by Rovers fans and, as borne out by the statistics, calls for Hughes’ return are unsurprising given the previous success he brought to Blackburn in his first spell in charge. That Venky’s have persevered with Steve Kean is commendable if they are willing to back him financially and believe he is the man to steer Blackburn from safety, but recent rumours that Kean was on the verge of signing an improved deal certainly defied recent form. Extending Kean’s contract given the current league position and discontent in the stands could at best be described as ill-timed, regardless of the confidence they have in Kean’s abilities. Typically, a string of results like those posted in recent weeks would see owners ripping up their manager’s contracts rather than reaching for a new one. Predictably the three managers who finished their spells at Blackburn with the highest points hauls, Dalglish, Graeme Souness and Mark Hughes, left on their own terms. It should also be noted that Brian Kidd’s last ten league games all came in the second tier of English football, where expectations were higher and therefore 1.1 points per game was not sufficient to avoid the sack. Therefore, of Kean’s predecessors who finished their spells at Rovers in the Premier League, none avoided dismissal having averaged less than 1 point per game in their last ten matches. Kean’s latest string of results have brought in just 0.6 points per game, which becomes all the more alarming for Kean when considering the fate of his predecessor and Blackburn’s comparatively strong record at the end of Allardyce’s tenure. In his final ten games, Allardyce delivered more than twice as many points as Kean has in his last ten games, yet this was not a sufficient tally to satisfy the new owners as they swiftly showed him the door. Kean can however point to a series of matches that have not yielded the results that performances have deserved to justify the current league standing. But for spot kick profligacy at home to Everton, a controversial late penalty at Carrow Road and a strong defensive performance by Chelsea in the last league outing, Blackburn could conceivably be occupying a much more comfortable league position. With a relatively young and inexperienced side, injuries to the more senior squad members have also not helped. Ryan Nelsen has yet to feature this term and his absence has been keenly felt at the heart of the defence, while both David Dunn and Morten Gamst Pedersen have already been out of action with injuries for spells this season, depriving the midfield of players with plenty of Premier League experience. Yet, with eleven games gone the results have clearly not been good enough to warrant a contract extension, particularly from a defensive point of view. Having succeeded Allardyce who was renowned for making sides defensively organised and hard to break down it is worrying to see that Blackburn have now failed to keep a clean sheet in their last 14 league games – a feat they have matched just once in the Premier League era, when conceding in 15 consecutive games between March and September 1996. With a trip to bottom of the table Wigan Athletic this weekend the need to secure three points is greater than ever for Steve Kean and his side. Based on the final results of former Rovers managers and the fate they suffered, recent form suggests that Kean is occupying a very perilous position. Defeat at the DW Stadium on Saturday would leave Kean with an identical record to Paul Ince in their final 13 league games (P13, W2, D3, L8). Paul Ince’s last game in charge of Blackburn? Wigan away. Categories: Blackburn Rovers, EPL, EPL Index Featured Article, EPL Index Statistical Comparisons, and EPL Opta Stats.' 'Tags: Blackburn Rovers, BRFC, english Premier league, EPL, epl opta stats, EPL Stats, Kean, Opta Stats, premier league, Premier League Stats, Rovers, and Steve Kean.